Lyme disease is caused by the bacterial spirochete Borrelia burgdorferi, which is transmitted to humans through tick bites. Though Lyme disease can be successfully treated with antibiotics, up to 25% of patients experience antibiotic-refractory Lyme arthritis of unknown cause. On page 2652, Bockenstedt and colleagues show by intravital microscopy that nonviable spirochetes remain in cartilage tissue sites in mice long after antibiotic treatment. In this image, amorphous GFP-labeled B. burgdorferi antigens are visualized in the patellar tendon (blue) at the junction of tendon and articular surface of the patella (red) in a sham-treated mouse. Citation Information: J Clin Invest. 2012;122(7):2329-2330. https://doi.org/10.1172/JCI64562. Citation Information: J Clin Invest. 2012;122(7):2331-2336. https://doi.org/10.1172/JCI60229. Venous thrombosis is a leading cause of morbidity and mortality in industrialized countries, especially in the elderly. Many risk factors have been identified for venous thrombosis that alter blood flow, activate the endothelium, and increase blood coagulation. However, the precise mechanisms that trigger clotting in large veins have not been fully elucidated. The most common site for initiation of the thrombus appears to be the valve pocket sinus, due to its tendency to become hypoxic. Activation of endothelial cells by hypoxia or possibly inflammatory stimuli would lead to surface expression of adhesion receptors that facilitate the binding of circulating leukocytes and microvesicles. Subsequent activation of the leukocytes induces expression of the potent procoagulant protein tissue factor that triggers thrombosis. Understanding the mechanisms of venous thrombosis may lead to the development of new treatments. Citation Information: J Clin Invest. 2012;122(7):2337-2343. https://doi.org/10.1172/JCI60434. Zebrafish have been widely used as a model system for studying developmental processes, but in the last decade, they have also emerged as a valuable system for modeling human disease. The development and function of zebrafish organs are strikingly similar to those of humans, and the ease of creating mutant or transgenic fish has facilitated the generation of disease models. Here, we highlight the use of zebrafish for defining disease pathways and for discovering new therapies. Citation Information: J Clin Invest. 2012;122(7):2344-2346. https://doi.org/10.1172/JCI63975. Citation Information: J Clin Invest. 2012;122(7):2346-2349. https://doi.org/10.1172/JCI63989. Mutations in numerous genes encoding ribosomal proteins (RPs) occur in 50%–70% of individuals with Diamond-Blackfan anemia (DBA), establishing the disease as a ribosomopathy. As described in this issue of JCI, Sankaran, Gazda, and colleagues used genome-wide exome sequencing to study DBA patients with no detectable mutations in RP genes. They identified two unrelated pedigrees in which the disease is associated with mutations in GATA1, which encodes an essential hematopoietic transcription factor with no known mechanistic links to ribosomes. These findings ignite an interesting and potentially emotional debate on how we define DBA and whether the term should be restricted to pure ribosomopathies. More generally, the work reflects the powerful knowledge and controversies arising from the deluge of data generated by new genetic technologies that are being used to analyze human diseases. Citation Information: J Clin Invest. 2012;122(7):2349-2352. https://doi.org/10.1172/JCI64196. WNT signaling plays a central role in the regulation of cellular growth and differentiation. 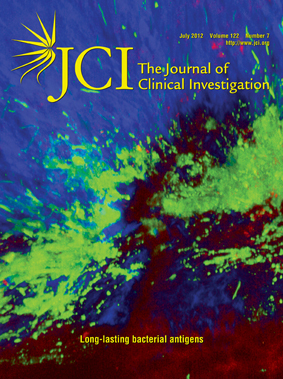 In this issue of the JCI, Mori et al. link WNT signaling to the oxidative capacity of adipocytes during obesity. They show that secreted frizzled-related protein 5 is an extracellular matrix–residing protein that is highly induced during obesity and inhibits oxidative phosphorylation in a tissue-autonomous manner, possibly by sequestering WNT3a. These results implicate local WNT signaling as an attractive target for combating obesity. Citation Information: J Clin Invest. 2012;122(7):2352-2354. https://doi.org/10.1172/JCI64239. The immune system’s battle against pathogens includes the “respiratory burst,” a rapid release of ROS from leukocytes, thought to play a role in destroying the invading species. In this issue of the JCI, Paiva et al. demonstrate that oxidative stress actually enhances infection with the protozoan Trypanosoma cruzi, by a mechanism that may involve facilitating parasite access to iron. Their findings suggest a novel direction for the development of drugs against intracellular parasites. Fibroblast growth factor 23: friend or foe in uremia? Citation Information: J Clin Invest. 2012;122(7):2354-2356. https://doi.org/10.1172/JCI64184. Uremia is a complex metabolic state marked by derangement of many signaling molecules and metabolic intermediates; of these, the massively increased levels of FGF23 are among the most striking. It has remained unclear whether FGF23 is directly implicated in the pathogenesis of chronic kidney disease (CKD) and its complications, a consequence of other dysregulated pathways, or perhaps an adaptive — and thus desirable — response. In this issue of the JCI, Shalhoub et al. describe the chronic effects of antibody-mediated FGF23 neutralization in a CKD mouse model, shedding new light on this complicated story and moving us one step closer to understanding the role of FGF23 in CKD. Citation Information: J Clin Invest. 2012;122(7):2356-2358. https://doi.org/10.1172/JCI64409. The molecular mapping of mutations that underlie congenital disorders of monogenic origin can result in both a broader understanding of the molecular basis of the disorder and novel therapeutic insights. Indeed, genotyping patients and then replicating the behavior of the mutant gene products in well-defined biochemical or electrophysiological systems will allow tailoring of therapy to be mutation- and protein sequence–dependent. In this issue of the JCI, Shen and colleagues describe such an approach that identified novel mutations in the α subunit of the nicotinic receptor linked to myasthenia gravis. Citation Information: J Clin Invest. 2012;122(7):2359-2368. https://doi.org/10.1172/JCI62923. Leigh syndrome (LS) is a subacute necrotizing encephalomyelopathy with gliosis in several brain regions that usually results in infantile death. Loss of murine Ndufs4, which encodes NADH dehydrogenase (ubiquinone) iron-sulfur protein 4, results in compromised activity of mitochondrial complex I as well as progressive neurodegenerative and behavioral changes that resemble LS. Here, we report the development of breathing abnormalities in a murine model of LS. Magnetic resonance imaging revealed hyperintense bilateral lesions in the dorsal brain stem vestibular nucleus (VN) and cerebellum of severely affected mice. The mutant mice manifested a progressive increase in apnea and had aberrant responses to hypoxia. Electrophysiological recordings within the ventral brain stem pre-Bötzinger respiratory complex were also abnormal. Selective inactivation of Ndufs4 in the VN, one of the principle sites of gliosis, also led to breathing abnormalities and premature death. Conversely, Ndufs4 restoration in the VN corrected breathing deficits and prolonged the life span of knockout mice. These data demonstrate that mitochondrial dysfunction within the VN results in aberrant regulation of respiration and contributes to the lethality of Ndufs4-knockout mice. Citation Information: J Clin Invest. 2012;122(7):2369-2383. https://doi.org/10.1172/JCI58457. Natural killer (NK) cells are primary effectors of innate immunity directed against transformed tumor cells. In response, tumor cells have developed mechanisms to evade NK cell–mediated lysis through molecular mechanisms that are not well understood. In the present study, we used a lentiviral shRNA library targeting more than 1,000 human genes to identify 83 genes that promote target cell resistance to human NK cell–mediated killing. Many of the genes identified in this genetic screen belong to common signaling pathways; however, none of them have previously been known to modulate susceptibility of human tumor cells to immunologic destruction. Gene silencing of two members of the JAK family (JAK1 and JAK2) increased the susceptibility of a variety of tumor cell types to NK-mediated lysis and induced increased secretion of IFN-γ by NK cells. Treatment of tumor cells with JAK inhibitors also increased susceptibility to NK cell activity. These findings may have important clinical implications and suggest that small molecule inhibitors of tyrosine kinases being developed as therapeutic antitumor agents may also have significant immunologic effects in vivo. Citation Information: J Clin Invest. 2012;122(7):2384-2394. https://doi.org/10.1172/JCI63067. Generation of a self-tolerant but antigen-responsive T cell repertoire occurs in the thymus. Although glucocorticoids are usually considered immunosuppressive, there is also evidence that they play a positive role in thymocyte selection. To address the question of how endogenous glucocorticoids might influence the adaptive immune response, we generated GRlck-Cre mice, in which the glucocorticoid receptor gene (GR) is deleted in thymocytes prior to selection. These mice were immunocompromised, with reduced polyclonal T cell proliferative responses to alloantigen, defined peptide antigens, and viral infection. This was not due to an intrinsic proliferation defect, because GR-deficient T cells responded normally when the TCR was cross-linked with antibodies or when the T cell repertoire was “fixed” with αβ TCR transgenes. Varying the affinity of self ligands in αβ TCR transgenic mice showed that affinities that would normally lead to thymocyte-positive selection caused negative selection, and alterations in the TCR repertoire of polyclonal T cells were confirmed by analysis of TCR Vβ CDR3 regions. Thus, endogenous glucocorticoids are required for a robust adaptive immune response because of their promotion of the selection of T cells that have sufficient affinity for self, and the absence of thymocyte glucocorticoid signaling results in an immunocompromised state. Citation Information: J Clin Invest. 2012;122(7):2395-2404. https://doi.org/10.1172/JCI45138. Tregs play a pivotal role in inducing and maintaining donor-specific transplant tolerance. The T cell immunoglobulin and mucin domain-3 protein (TIM-3) is expressed on many fully activated effector T cells. Along with program death 1 (PD-1), TIM-3 is used as a marker for exhausted effector T cells, and interaction with its ligand, galectin-9, leads to selective death of TIM-3+ cells. We report herein the presence of a galectin-9–sensitive CD4+FoxP3+TIM-3+ population of T cells, which arose from CD4+FoxP3+TIM-3– proliferating T cells in vitro and in vivo and were often PD-1+. These cells became very prominent among graft-infiltrating Tregs during allograft response. The frequency and number of TIM-3+ Tregs peaked at the time of graft rejection and declined thereafter. Moreover, these cells also arise in a tolerance-promoting donor-specific transfusion model, representing a pool of proliferating, donor-specific Tregs. Compared with TIM-3– Tregs, TIM-3+ Tregs, which are often PD-1+ as well, exhibited higher in vitro effector function and more robust expression of CD25, CD39, CD73, CTLA-4, IL-10, and TGF-β but not galectin-9. However, these TIM-3+ Tregs did not flourish when passively transferred to newly transplanted hosts. These data suggest that a heretofore unrecognized graft-infiltrating, short-lived subset of Tregs can restrain rejection. Citation Information: J Clin Invest. 2012;122(7):2405-2416. https://doi.org/10.1172/JCI63604. Preadipocytes secrete several WNT family proteins that act through autocrine/paracrine mechanisms to inhibit adipogenesis. The activity of WNT ligands is often decreased by secreted frizzled-related proteins (SFRPs). Sfrp5 is strongly induced during adipocyte differentiation and increases in adipocytes during obesity, presumably to counteract WNT signaling. We tested the hypothesis that obesity-induced Sfrp5 expression promotes the development of new adipocytes by inhibiting endogenous suppressors of adipogenesis. As predicted, mice that lack functional SFRP5 were resistant to diet-induced obesity. However, counter to our hypothesis, we found that adipose tissue of SFRP5-deficient mice had similar numbers of adipocytes, but a reduction in large adipocytes. Transplantation of adipose tissue from SFRP5-deficient mice into leptin receptor–deficient mice indicated that the effects of SFRP5 deficiency are tissue-autonomous. Mitochondrial gene expression was increased in adipose tissue and cultured adipocytes from SFRP5-deficient mice. In adipocytes, lack of SFRP5 stimulated oxidative capacity through increased mitochondrial activity, which was mediated in part by PGC1α and mitochondrial transcription factor A. WNT3a also increased oxygen consumption and the expression of mitochondrial genes. Thus, our findings support a model of adipogenesis in which SFRP5 inhibits WNT signaling to suppress oxidative metabolism and stimulate adipocyte growth during obesity. Citation Information: J Clin Invest. 2012;122(7):2417-2427. https://doi.org/10.1172/JCI61462. Altered lipid metabolism underlies several major human diseases, including obesity and type 2 diabetes. However, lipid metabolism pathophysiology remains poorly understood at the molecular level. Insulin is the primary stimulator of hepatic lipogenesis through activation of the SREBP-1c transcription factor. Here we identified cyclin-dependent kinase 8 (CDK8) and its regulatory partner cyclin C (CycC) as negative regulators of the lipogenic pathway in Drosophila, mammalian hepatocytes, and mouse liver. The inhibitory effect of CDK8 and CycC on de novo lipogenesis was mediated through CDK8 phosphorylation of nuclear SREBP-1c at a conserved threonine residue. Phosphorylation by CDK8 enhanced SREBP-1c ubiquitination and protein degradation. Importantly, consistent with the physiologic regulation of lipid biosynthesis, CDK8 and CycC proteins were rapidly downregulated by feeding and insulin, resulting in decreased SREBP-1c phosphorylation. Moreover, overexpression of CycC efficiently suppressed insulin and feeding–induced lipogenic gene expression. Taken together, these results demonstrate that CDK8 and CycC function as evolutionarily conserved components of the insulin signaling pathway in regulating lipid homeostasis. Citation Information: J Clin Invest. 2012;122(7):2428-2438. https://doi.org/10.1172/JCI60580. Citation Information: J Clin Invest. 2012;122(7):2439-2443. https://doi.org/10.1172/JCI63597. Diamond-Blackfan anemia (DBA) is a hypoplastic anemia characterized by impaired production of red blood cells, with approximately half of all cases attributed to ribosomal protein gene mutations. We performed exome sequencing on two siblings who had no known pathogenic mutations for DBA and identified a mutation in the gene encoding the hematopoietic transcription factor GATA1. This mutation, which occurred at a splice site of the GATA1 gene, impaired production of the full-length form of the protein. We further identified an additional patient carrying a distinct mutation at the same splice site of the GATA1 gene. These findings provide insight into the pathogenesis of DBA, showing that the reduction in erythropoiesis associated with the disease can arise from causes other than defects in ribosomal protein genes. These results also illustrate the multifactorial role of GATA1 in human hematopoiesis. Citation Information: J Clin Invest. 2012;122(7):2444-2453. https://doi.org/10.1172/JCI61953. Obesity-induced inflammation is a key component of systemic insulin resistance, which is a hallmark of type 2 diabetes. A major driver of this inflammation/insulin resistance syndrome is the accumulation of proinflammatory macrophages in adipose tissue and liver. We found that the orphan GPCR Gpr21 was highly expressed in the hypothalamus and macrophages of mice and that whole-body KO of this receptor led to a robust improvement in glucose tolerance and systemic insulin sensitivity and a modest lean phenotype. The improvement in insulin sensitivity in the high-fat diet–fed (HFD-fed) Gpr21 KO mouse was traced to a marked reduction in tissue inflammation caused by decreased chemotaxis of Gpr21 KO macrophages into adipose tissue and liver. Furthermore, mice lacking macrophage expression of Gpr21 were protected from HFD-induced inflammation and displayed improved insulin sensitivity. Results of in vitro chemotaxis studies in human monocytes suggested that the defect in chemotaxis observed ex vivo and in vivo in mice is also translatable to humans. Cumulatively, our data indicate that GPR21 has a critical function in coordinating macrophage proinflammatory activity in the context of obesity-induced insulin resistance. Citation Information: J Clin Invest. 2012;122(7):2454-2468. https://doi.org/10.1172/JCI60842. In inflammatory CNS conditions such as multiple sclerosis (MS), current options to treat clinical relapse are limited, and more selective agents are needed. Disruption of the blood-brain barrier (BBB) is an early feature of lesion formation that correlates with clinical exacerbation, leading to edema, excitotoxicity, and entry of serum proteins and inflammatory cells. Here, we identify astrocytic expression of VEGF-A as a key driver of BBB permeability in mice. Inactivation of astrocytic Vegfa expression reduced BBB breakdown, decreased lymphocyte infiltration and neuropathology in inflammatory and demyelinating lesions, and reduced paralysis in a mouse model of MS. Knockdown studies in CNS endothelium indicated activation of the downstream effector eNOS as the principal mechanism underlying the effects of VEGF-A on the BBB. Systemic administration of the selective eNOS inhibitor cavtratin in mice abrogated VEGF-A–induced BBB disruption and pathology and protected against neurologic deficit in the MS model system. Collectively, these data identify blockade of VEGF-A signaling as a protective strategy to treat inflammatory CNS disease. Citation Information: J Clin Invest. 2012;122(7):2469-2481. https://doi.org/10.1172/JCI62044. In prostate cancer, the signals that drive cell proliferation change as tumors progress from castration-sensitive (androgen-dominant) to castration-resistant states. While the mechanisms underlying this change remain uncertain, characterization of common signaling components that regulate both stages of prostate cancer proliferation is important for developing effective treatment strategies. Here, we demonstrate that paxillin, a known cytoplasmic adaptor protein, regulates both androgen- and EGF-induced nuclear signaling. We show that androgen and EGF promoted MAPK-dependent phosphorylation of paxillin, resulting in nuclear translocation of paxillin. We found nuclear paxillin could then associate with androgen-stimulated androgen receptor (AR). This complex bound AR-sensitive promoters, retaining AR within the nucleus and regulating AR-mediated transcription. Nuclear paxillin also complexed with ERK and ELK1, mediating c-FOS and cyclin D1 expression; this was followed by proliferation. Thus, paxillin is a liaison between extranuclear MAPK signaling and nuclear transcription in response to androgens and growth factors, making it a potential regulator of both castration-sensitive and castration-resistant prostate cancer. Accordingly, paxillin was required for normal growth of human prostate cancer cell xenografts, and its expression was elevated in human prostate cancer tissue microarrays. Paxillin is therefore a potential biomarker for prostate cancer proliferation and a possible therapeutic target for prostate cancer treatment. Citation Information: J Clin Invest. 2012;122(7):2482-2498. https://doi.org/10.1172/JCI63239. Filamentous fungi are a common cause of blindness and visual impairment worldwide. Using both murine model systems and in vitro human neutrophils, we found that NADPH oxidase produced by neutrophils was essential to control the growth of Aspergillus and Fusarium fungi in the cornea. We demonstrated that neutrophil oxidant production and antifungal activity are dependent on CD18, but not on the β-glucan receptor dectin-1. We used mutant A. fumigatus strains to show that the reactive oxygen species–sensing transcription factor Yap1, superoxide dismutases, and the Yap1-regulated thioredoxin antioxidant pathway are each required for protection against neutrophil-mediated oxidation of hyphae as well as optimal survival of fungal hyphae in vivo. We also demonstrated that thioredoxin inhibition using the anticancer drug PX-12 increased the sensitivity of fungal hyphae to both H2O2- and neutrophil-mediated killing in vitro. Additionally, topical application of PX-12 significantly enhanced neutrophil-mediated fungal killing in infected mouse corneas. Cumulatively, our data reveal critical host oxidative and fungal anti-oxidative mediators that regulate hyphal survival during infection. Further, these findings also indicate that targeting fungal anti-oxidative defenses via PX-12 may represent an efficacious strategy for treating fungal infections. Citation Information: J Clin Invest. 2012;122(7):2499-2508. https://doi.org/10.1172/JCI62970. Citation Information: J Clin Invest. 2012;122(7):2509-2518. https://doi.org/10.1172/JCI62617. Cardiac conduction system (CCS) disease, which results in disrupted conduction and impaired cardiac rhythm, is common with significant morbidity and mortality. Current treatment options are limited, and rational efforts to develop cell-based and regenerative therapies require knowledge of the molecular networks that establish and maintain CCS function. Recent genome-wide association studies (GWAS) have identified numerous loci associated with adult human CCS function, including TBX5 and SCN5A. We hypothesized that TBX5, a critical developmental transcription factor, regulates transcriptional networks required for mature CCS function. We found that deletion of Tbx5 from the mature murine ventricular conduction system (VCS), including the AV bundle and bundle branches, resulted in severe VCS functional consequences, including loss of fast conduction, arrhythmias, and sudden death. Ventricular contractile function and the VCS fate map remained unchanged in VCS-specific Tbx5 knockouts. However, key mediators of fast conduction, including Nav1.5, which is encoded by Scn5a, and connexin 40 (Cx40), demonstrated Tbx5-dependent expression in the VCS. We identified a TBX5-responsive enhancer downstream of Scn5a sufficient to drive VCS expression in vivo, dependent on canonical T-box binding sites. Our results establish a direct molecular link between Tbx5 and Scn5a and elucidate a hierarchy between human GWAS loci that affects function of the mature VCS, establishing a paradigm for understanding the molecular pathology of CCS disease. Citation Information: J Clin Invest. 2012;122(7):2519-2530. https://doi.org/10.1172/JCI62613. The contraction pattern of the heart relies on the activation and conduction of the electrical impulse. Perturbations of cardiac conduction have been associated with congenital and acquired arrhythmias as well as cardiac arrest. The pattern of conduction depends on the regulation of heterogeneous gene expression by key transcription factors and transcriptional enhancers. Here, we assessed the genome-wide occupation of conduction system–regulating transcription factors TBX3, NKX2-5, and GATA4 and of enhancer-associated coactivator p300 in the mouse heart, uncovering cardiac enhancers throughout the genome. Many of the enhancers colocalized with ion channel genes repressed by TBX3, including the clustered sodium channel genes Scn5a, essential for cardiac function, and Scn10a. We identified 2 enhancers in the Scn5a/Scn10a locus, which were regulated by TBX3 and its family member and activator, TBX5, and are functionally conserved in humans. We also provided evidence that a SNP in the SCN10A enhancer associated with alterations in cardiac conduction patterns in humans disrupts TBX3/TBX5 binding and reduces the cardiac activity of the enhancer in vivo. Thus, the identification of key regulatory elements for cardiac conduction helps to explain how genetic variants in noncoding regulatory DNA sequences influence the regulation of cardiac conduction and the predisposition for cardiac arrhythmias. Citation Information: J Clin Invest. 2012;122(7):2531-2542. https://doi.org/10.1172/JCI58525. Oxidative damage contributes to microbe elimination during macrophage respiratory burst. Nuclear factor, erythroid-derived 2, like 2 (NRF2) orchestrates antioxidant defenses, including the expression of heme-oxygenase–1 (HO-1). Unexpectedly, the activation of NRF2 and HO-1 reduces infection by a number of pathogens, although the mechanism responsible for this effect is largely unknown. We studied Trypanosoma cruzi infection in mice in which NRF2/HO-1 was induced with cobalt protoporphyrin (CoPP). CoPP reduced parasitemia and tissue parasitism, while an inhibitor of HO-1 activity increased T. cruzi parasitemia in blood. CoPP-induced effects did not depend on the adaptive immunity, nor were parasites directly targeted. We also found that CoPP reduced macrophage parasitism, which depended on NRF2 expression but not on classical mechanisms such as apoptosis of infected cells, induction of type I IFN, or NO. We found that exogenous expression of NRF2 or HO-1 also reduced macrophage parasitism. Several antioxidants, including NRF2 activators, reduced macrophage parasite burden, while pro-oxidants promoted it. Reducing the intracellular labile iron pool decreased parasitism, and antioxidants increased the expression of ferritin and ferroportin in infected macrophages. Ferrous sulfate reversed the CoPP-induced decrease in macrophage parasite burden and, given in vivo, reversed their protective effects. Our results indicate that oxidative stress contributes to parasite persistence in host tissues and open a new avenue for the development of anti–T. cruzi drugs. Citation Information: J Clin Invest. 2012;122(7):2543-2553. https://doi.org/10.1172/JCI61405. Chronic kidney disease–mineral and bone disorder (CKD-MBD) is associated with secondary hyperparathyroidism (HPT) and serum elevations in the phosphaturic hormone FGF23, which may be maladaptive and lead to increased morbidity and mortality. To determine the role of FGF23 in the pathogenesis of CKD-MBD and development of secondary HPT, we developed a monoclonal FGF23 antibody to evaluate the impact of chronic FGF23 neutralization on CKD-MBD, secondary HPT, and associated comorbidities in a rat model of CKD-MBD. CKD-MBD rats fed a high-phosphate diet were treated with low or high doses of FGF23-Ab or an isotype control antibody. Neutralization of FGF23 led to sustained reductions in secondary HPT, including decreased parathyroid hormone, increased vitamin D, increased serum calcium, and normalization of bone markers such as cancellous bone volume, trabecular number, osteoblast surface, osteoid surface, and bone-formation rate. In addition, we observed dose-dependent increases in serum phosphate and aortic calcification associated with increased risk of mortality in CKD-MBD rats treated with FGF23-Ab. Thus, mineral disturbances caused by neutralization of FGF23 limited the efficacy of FGF23-Ab and likely contributed to the increased mortality observed in this CKD-MBD rat model. Citation Information: J Clin Invest. 2012;122(7):2554-2566. https://doi.org/10.1172/JCI58488. Coordinated translation initiation is coupled with cell cycle progression and cell growth, whereas excessive ribosome biogenesis and translation initiation often lead to tumor transformation and survival. Hepatocellular carcinoma (HCC) is among the most common and aggressive cancers worldwide and generally displays inherently high resistance to chemotherapeutic drugs. We found that RACK1, the receptor for activated C-kinase 1, was highly expressed in normal liver and frequently upregulated in HCC. Aberrant expression of RACK1 contributed to in vitro chemoresistance as well as in vivo tumor growth of HCC. These effects depended on ribosome localization of RACK1. Ribosomal RACK1 coupled with PKCβII to promote the phosphorylation of eukaryotic initiation factor 4E (eIF4E), which led to preferential translation of the potent factors involved in growth and survival. Inhibition of PKCβII or depletion of eIF4E abolished RACK1-mediated chemotherapy resistance of HCC in vitro. Our results imply that RACK1 may function as an internal factor involved in the growth and survival of HCC and suggest that targeting RACK1 may be an efficacious strategy for HCC treatment. Citation Information: J Clin Invest. 2012;122(7):2567-2577. https://doi.org/10.1172/JCI62378. An emerging theory of schizophrenia postulates that hypofunction of adenosine signaling may contribute to its pathophysiology. This study was designed to test the “adenosine hypothesis” of schizophrenia and to evaluate focal adenosine-based strategies for therapy. We found that augmentation of adenosine by pharmacologic inhibition of adenosine kinase (ADK), the key enzyme of adenosine clearance, exerted antipsychotic-like activity in mice. Further, overexpression of ADK in transgenic mice was associated with attentional impairments linked to schizophrenia. We observed that the striatal adenosine A2A receptor links adenosine tone and psychomotor response to amphetamine, an indicator of dopaminergic signaling. Finally, intrastriatal implants of engineered adenosine-releasing cells restored the locomotor response to amphetamine in mice overexpressing ADK, whereas the same grafts placed proximal to the hippocampus of transgenic mice reversed their working memory deficit. This functional double dissociation between striatal and hippocampal adenosine demonstrated in Adk transgenic mice highlights the independent contributions of these two interconnected brain regions in the pathophysiology of schizophrenia and thus provides the rationale for developing local adenosine augmentation therapies for the treatment of schizophrenia. Citation Information: J Clin Invest. 2012;122(7):2578-2589. https://doi.org/10.1172/JCI62848. The transcription factor FOXO1 plays a central role in metabolic homeostasis by regulating leptin and insulin activity in many cell types, including neurons. However, the neurons mediating these effects and the identity of the molecular targets through which FOXO1 regulates metabolism remain to be defined. Here, we show that the ventral medial nucleus of the hypothalamus (VMH) is a key site of FOXO1 action. We found that mice lacking FOXO1 in steroidogenic factor 1 (SF-1) neurons of the VMH are lean due to increased energy expenditure. The mice also failed to appropriately suppress energy expenditure in response to fasting. Furthermore, these mice displayed improved glucose tolerance due to increased insulin sensitivity in skeletal muscle and heart. Gene expression profiling and sequence analysis revealed several pathways regulated by FOXO1. In addition, we identified the nuclear receptor SF-1 as a direct FOXO1 transcriptional target in the VMH. Collectively, our data suggest that the transcriptional networks modulated by FOXO1 in VMH neurons are key components in the regulation of energy balance and glucose homeostasis. Citation Information: J Clin Invest. 2012;122(7):2590-2600. https://doi.org/10.1172/JCI58978. Allergic inflammation triggered by exposure of an allergen frequently leads to the onset of chronic inflammatory diseases such as atopic dermatitis (AD) and bronchial asthma. The mechanisms underlying chronicity in allergic inflammation remain unresolved. Periostin, a recently characterized matricellular protein, interacts with several cell surface integrin molecules, providing signals for tissue development and remodeling. Here we show that periostin is a critical mediator for the amplification and persistence of allergic inflammation using a mouse model of skin inflammation. Th2 cytokines IL-4 and IL-13 stimulated fibroblasts to produce periostin, which interacted with αv integrin, a functional periostin receptor on keratinocytes, inducing production of proinflammatory cytokines, which consequently accelerated Th2-type immune responses. Accordingly, inhibition of periostin or αv integrin prevented the development or progression of allergen-induced skin inflammation. Thus, periostin sets up a vicious circle that links Th2-type immune responses to keratinocyte activation and plays a critical role in the amplification and chronicity of allergic skin inflammation. Citation Information: J Clin Invest. 2012;122(7):2601-2612. https://doi.org/10.1172/JCI45785. Citation Information: J Clin Invest. 2012;122(7):2613-2621. https://doi.org/10.1172/JCI63415. Congenital myasthenic syndromes (CMSs) are neuromuscular disorders that can be caused by defects in ace­tylcholine receptor (AChR) function. Disease-associated point mutants can reveal the unsuspected functional significance of mutated residues. We identified two pathogenic mutations in the extracellular domain of the AChR α subunit (AChRα) in a patient with myasthenic symptoms since birth: a V188M mutation in the C-loop and a heteroallelic G74C mutation in the main immunogenic region. The G74C mutation markedly reduced surface AChR expression in cultured cells, whereas the V188M mutant was expressed robustly but had severely impaired kinetics. Single-channel patch-clamp analysis indicated that V188M markedly decreased the apparent AChR channel opening rate and gating efficiency. Mutant cycle analysis of energetic coupling among conserved residues within or dispersed around the AChRα C-loop revealed that V188 is functionally linked to Y190 in the C-loop and to D200 in β-strand 10, which connects to the M1 transmembrane domain. Furthermore, V188M weakens inter-residue coupling of K145 in β-strand 7 with Y190 and with D200. Cumulatively, these results indicate that V188 of AChRα is part of an interdependent tetrad that contributes to rearrangement of the C-loop during the initial coupling of agonist binding to channel gating. Citation Information: J Clin Invest. 2012;122(7):2622-2636. https://doi.org/10.1172/JCI61762. Identification of the cellular mechanisms that mediate cancer cell chemosensitivity is important for developing new cancer treatment strategies. Several chemotherapeutic drugs increase levels of the posttranslational modifier ISG15, which suggests that ISGylation could suppress oncogenesis. However, how ISGylation of specific target proteins controls tumorigenesis is unknown. Here, we identified proteins that are ISGylated in response to chemotherapy. Treatment of a human mammary epithelial cell line with doxorubicin resulted in ISGylation of the p53 family protein p63. An alternative splice variant of p63, ΔNp63α, suppressed the transactivity of other p53 family members, and its expression was abnormally elevated in various human epithelial tumors, suggestive of an oncogenic role for this variant. We showed that ISGylation played an essential role in the downregulation of ΔNp63α. Anticancer drugs, including doxorubicin, induced ΔNp63α ISGylation and caspase-2 activation, leading to cleavage of ISGylated ΔNp63α in the nucleus and subsequent release of its inhibitory domain to the cytoplasm. ISGylation ablated the ability of ΔNp63α to promote anchorage-independent cell growth and tumor formation in vivo as well to suppress the transactivities of proapoptotic p53 family members. These findings establish ISG15 as a tumor suppressor via its conjugation to ΔNp63α and provide a molecular rationale for therapeutic use of doxorubicin against ΔNp63α-mediated cancers. Citation Information: J Clin Invest. 2012;122(7):2637-2651. https://doi.org/10.1172/JCI62058. EGFR activation is both a key molecular driver of disease progression and the target of a broad class of molecular agents designed to treat advanced cancer. Nevertheless, resistance develops through several mechanisms, including activation of AKT signaling. Though much is known about the specific molecular lesions conferring resistance to anti-EGFR–based therapies, additional molecular characterization of the downstream mediators of EGFR signaling may lead to the development of new classes of targeted molecular therapies to treat resistant disease. We identified a transcriptional network involving the tumor suppressors Krüppel-like factor 6 (KLF6) and forkhead box O1 (FOXO1) that negatively regulates activated EGFR signaling in both cell culture and in vivo models. Furthermore, the use of the FDA-approved drug trifluoperazine hydrochloride (TFP), which has been shown to inhibit FOXO1 nuclear export, restored sensitivity to AKT-driven erlotinib resistance through modulation of the KLF6/FOXO1 signaling cascade in both cell culture and xenograft models of lung adenocarcinoma. Combined, these findings define a novel transcriptional network regulating oncogenic EGFR signaling and identify a class of FDA-approved drugs as capable of restoring chemosensitivity to anti-EGFR–based therapy for the treatment of metastatic lung adenocarcinoma. Citation Information: J Clin Invest. 2012;122(7):2661-2671. https://doi.org/10.1172/JCI61303. Citation Information: J Clin Invest. 2012;122(7):2672-2679. https://doi.org/10.1172/JCI61427. Citation Information: J Clin Invest. 2012;122(7):2680-2689. https://doi.org/10.1172/JCI63338. More than 15% of cancer deaths worldwide are associated with underlying infections or inflammatory conditions, therefore understanding how inflammation contributes to cancer etiology is important for both cancer prevention and treatment. Inflamed tissues are known to harbor elevated etheno-base (ε-base) DNA lesions induced by the lipid peroxidation that is stimulated by reactive oxygen and nitrogen species (RONS) released from activated neutrophils and macrophages. Inflammation contributes to carcinogenesis in part via RONS-induced cytotoxic and mutagenic DNA lesions, including ε-base lesions. The mouse alkyl adenine DNA glycosylase (AAG, also known as MPG) recognizes such base lesions, thus protecting against inflammation-associated colon cancer. Two other DNA repair enzymes are known to repair ε-base lesions, namely ALKBH2 and ALKBH3; thus, we sought to determine whether these DNA dioxygenase enzymes could protect against chronic inflammation-mediated colon carcinogenesis. Using established chemically induced colitis and colon cancer models in mice, we show here that ALKBH2 and ALKBH3 provide cancer protection similar to that of the DNA glycosylase AAG. Moreover, Alkbh2 and Alkbh3 each display apparent epistasis with Aag. Surprisingly, deficiency in all 3 DNA repair enzymes confers a massively synergistic phenotype, such that animals lacking all 3 DNA repair enzymes cannot survive even a single bout of chemically induced colitis. Citation Information: J Clin Invest. 2012;122(7):2690-2701. https://doi.org/10.1172/JCI63060. Citation Information: J Clin Invest. 2012;122(7):2702-2702. https://doi.org/10.1172/JCI64256. Citation Information: J Clin Invest. 2012;122(7):2702-2702. https://doi.org/10.1172/JCI65314. Citation Information: J Clin Invest. 2012;122(7):2703-2703. https://doi.org/10.1172/JCI64369. Citation Information: J Clin Invest. 2012;122(7):2704-2704. https://doi.org/10.1172/JCI64981.